Shares of Hewlett-Packard Co. tumbled in heavy trading Monday following CEO Mark Hurd's sudden forced resignation from the world's largest technology company. Hurd stepped down from the post Friday following allegations that he falsified expense reports to conceal a relationship with a former contractor. 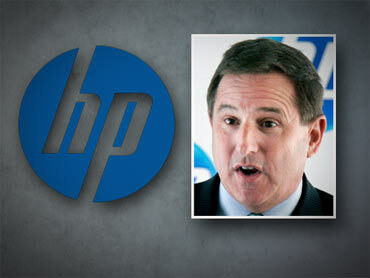 HP's shares fell $3.40, or 7.4 percent, to $42.62 - nearing the stock's 52-week low of $41.85. Volume totaled nearly nine times the stock's average trading volume of 18 million shares. The stock has lost nearly 17 percent of its value so far this year. Under Hurd, HP spent more than $20 billion on acquisitions and cut more than 40,000 jobs as he helped transform the company from a computer and printer maker dependent on ink sales for profits to a well-rounded technology leader with a broad range of hardware and business services offerings. "We are frankly surprised and disappointed as Hurd was a strong leader and helped transform HP into a leading player," said Kaufman Bros. analyst Shaw Wu in a note to investors. But, he added, HP's "culture of winning" that Hurd helped shape will likely remain intact. Standard & Poor's equity analyst Tom Smith, however, cut his investment recommendation on HP's shares to "Buy" from "Strong Buy." He said the events add uncertainty to what's been a "generally strong management story." Janney Capital Markets analyst William Fearnley Jr. called Hurd's ouster a "stunner" but added he still believes in the stock. Even so, he said the events - and their sudden nature - "will cast a shadow over the story and the stock until a new CEO is chosen." It was too soon to tell Monday who that new CEO might be. Chief Financial Officer Cathie Lesjak, who is now serving as interim CEO, has taken herself out of the running for the permanent post. Baird analyst Jayson Noland said an external hire will be the most likely outcome, though he thinks it is possible that the company will hire an internal candidate, given that HP has "no desire for a strategic change" in the company's direction. "Either way, we expect the culture of metric-based performance and accountability Mr. Hurd brought to HP to continue," Noland wrote.